From seasoned business leaders to those just beginning their careers, everyone can benefit from Balance. Balance lays out a plan for achieving goals in the social, professional, financial, health, and knowledge spheres of life. 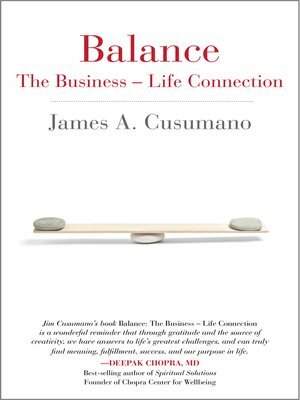 By integrating the goals in each aspect of one's life, Cusumano illustrates the interconnectedness of one's personal, spiritual, and business lives and the dependence of each sphere's success on the success of the others. Without balance between them, the goals in each sphere cannot be achieved. Cusumano stresses that this must be balanced with a second, undeniable responsibility: a dedication to the sustainability of our world and its future. On a smaller scale Balance deals with relationships with family, friends, business protocol, and treatment of employees. But on a larger scale Cusumano tackles business's impact on the community, the environment, and the world.